Anchorage’s Finnigan Donley packed drama and dominance into a single slalom run Sunday to leave Big Sky, Montana, as the undisputed champion of the Western Regional U14 alpine ski championships. Donley, who turned 14 last month, secured his third gold medal in three days with a sizzling second run that vaulted him from fourth place to first place in the boys slalom. Down by .02 of a second after the first run, he ran the gates 1.52 seconds faster than anyone else in the second run to win comfortably by 1.5 seconds. Donley, who also won the giant slalom and super-G, was the leader of an eight-skier contingent from Alaska that made a big impression at the championships for skiers 14 years and younger. Daniel Ferucci posted a pair of top-three finishes, Ava Schweiger registered two top-four finishes and Abby Kragt and Brooke-Lynn Allard each posted a top-10 finish. 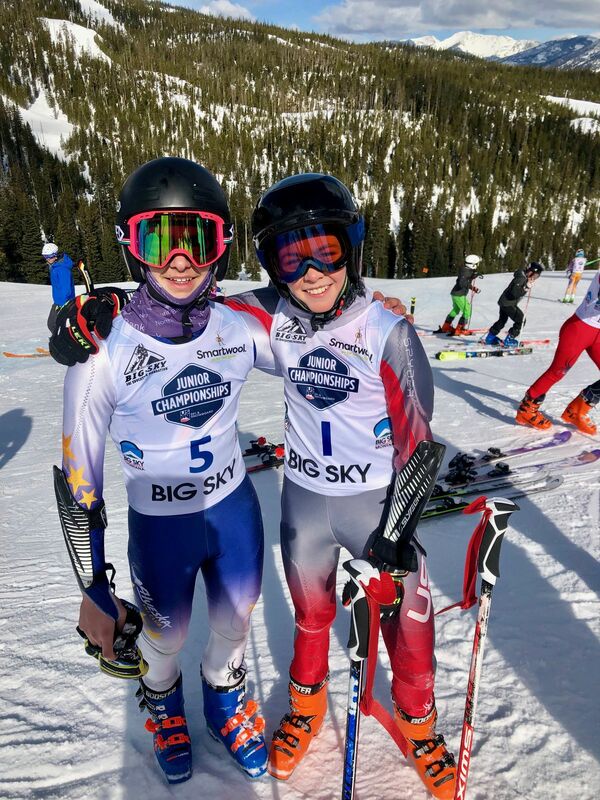 Donley and Ferucci finished 1-2 in the giant slalom and 1-3 in the super-G, and Schweiger claimed third place in the girls giant slalom and fourth place in the super-G. In Sunday’s slalom, Kragt placed sixth and Allard was ninth for their best results of the race series. The eight skiers — Donley, Ferucci, Schweiger, Kragt and Ben Neuberger of Alyeska Ski Club and Max Carl, Brooke-Lynn Allard and Madison Allard of Arctic Valley Ski Club — are helping Alaska asserts itself on the national level. Sparky Anderson, the head coach of UAA’s Division I ski team and the former coach of the Alyeska Ski Club, thinks Donley’s victories may be the first for an Alaskan at the U14 level in more than a decade. “I’ve been impressed with what I’ve seen in recent years with the development of alpine kids in the Alaska Division,” Anderson said by text. “It’s refreshing. I once again have a pool of talented local athletes who could hopefully compete at a collegiate level. A dozen years ago or so, skiers like Kieffer Christianson, Adrienne Wiggins, Alannah Rice, John Love and Rory Casey were winning medals at the regional level. Christianson went on to make the U.S. Ski Team before retiring after a series of head injuries. Back in the 1980s and 1990s, Alaskans were major players on the alpine scene, with Tommy Moe and Hilary Lindh claiming Olympic medals and skiers like Megan Gerety, Mike Makar and Kjerstie Bjorn-Roli proving themselves at the national and international level. In 2000, Andre Horton of Anchorage earned a spot on the national team, the last Alaskan to do that until Christianson made the team. Now Alaska’s junior skiers are making noise again. Donley’s sweep earned him an invitation to next week’s U16 national championships in Breckinridge, Colorado. He won Friday’s super-G race by more than half a second, and in the giant slalom he edged runner-up Ferucci by .16 of a second. Neuberger was 25th in the giant slalom, and Carl was 34th in the super-G and 40th in the slalom for the Alaska boys. For the girls, Kragt’s sixth-place slalom finish followed a 15th-place finish in the super-G and a 26th-place showing in the giant slalom. Brooke-Lynn Allard was 41st in the giant slalom and 43rd in the super-G before cracking the top 10 in the slalom, and Madison Allard was 46th in the giant slalom and 41st in the slalom. Schweiger’s worst finish came in the slalom, where she was 45th. She persevered through a bad first run -- she had to hike up the course after missing gates on her first run -- and then came back with the fifth-fastest time in the second run.